So I FINALLY got around to transferring the pictures from my phone to my computer. I literally had hundreds of pictures on my phone and had never uploaded them. The quality is pretty low of most of the pics...but I'll share a few here and there in the near future. Today I'm sharing a picture of Henry's first (and only) time going to a movie theater. Since the craziness with our house started Michael and I have gone on very few dates. We used to love going to movies but it doesn't make sense to go anymore when 1. there's not much out we want to see, 2. we have to pay someone to watch the kids so it makes the movie three times more expensive than normal, and 3. we can't stay up late enough to go to a movie in the evening. Sad, I know. The day after Henry was born my mom took the other 3 kids home with her. Michael worked on the house while I enjoyed my time in the hospital with Henry. The afternoon we left the hospital, Michael came and picked us up and we took the opportunity to go straight to the movie theater!! Crazy - maybe - but it was fun. 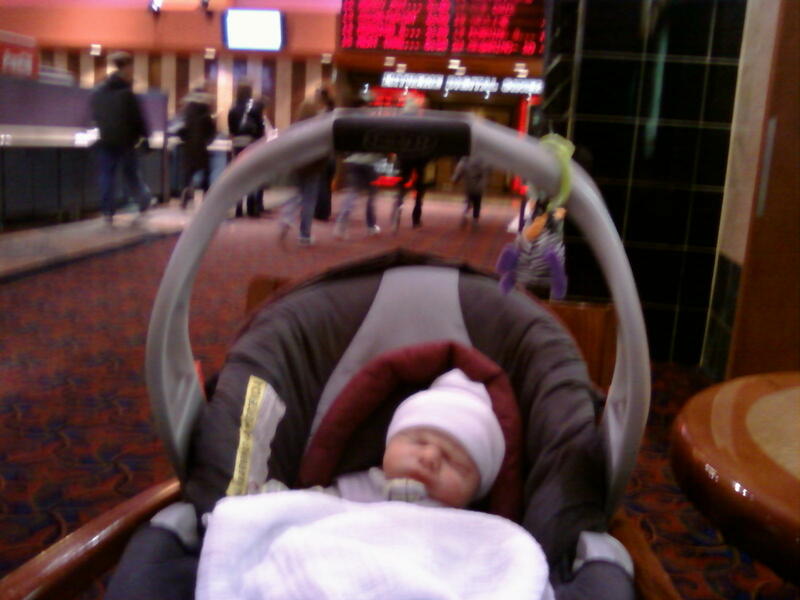 In the afternoon on a weekday, there aren't many people at the theater...and newborns sleep so much that we weren't worried about him crying in the middle of the movie. Perfect!